Back in October of 2017, I grabbed a handful of CDs to review and process before being aired here on CHSR, as is custom, and I happened upon an album entitled “West Coast Reign” from an unknown-to-me artist named Vic Horvath. I was sufficiently captivated by the songwriting and the presentation that I felt compelled to write a more detailed review for the CHSR website, which you can read here. The cool thing is that there is a lot more to this story that transpired after I posted the review. One of my other recent pursuits involved volunteering my time to help find new talent and program the Living Roots Music Festival for 2018. I should include the caveat that Eddie Young, the founder and festival organizer, did roughly 99.26% of this work himself, but I was hoping to make a small contribution. Upon discovering Vic’s music, I reached out to them just to show appreciation and thank them for the excellent music. I asked if there were plans to visit the east coast, gave details on the Living Roots Festival, and interest was piqued. Plans were made. Letters were written. Funding was secured, and Vic’s trip to the east was on. A small tour was booked around the Living Roots festival, and I had the pleasure of catching Vic’s set on Thursday, May 24th, at The Capital. And it was worth the effort. The letter-writing, the planning, and everything in between. Well, at least for me, and also hopefully for Vic, who is a captivating artist with a charming, understated, but compelling stage presence. The strength of the songwriting that was immediately evident on the album is highlighted very well, even with arrangements that are stripped-down from the studio recordings. To be fair, the album production is also understated, but the occasional drum kit was replaced with a stomp pad, and the rest of the sonic space was filled with Vic’s honest vocals and guitar playing. Sneaky good guitar playing. Moving between tunings and time signatures, Vic fit a couple of influential cover songs into a set of otherwise original material, paying tribute to Timber Timbre (Mountain Top) and the pride of Perth Andover, Matt Andersen (Tell Me). Great as those tunes were, they weren’t my favourites in the set. Those were, in some particular order: Shiny Shotguns, Hold Ground, and what indeed stood up as one of my favourite tracks of 2017 – Don’t Go Lightly. I don’t have much more to say. It was a fantastic live show and I got to meet a great human from the other side of the country, all because of music found off the beaten path and the connections made as a result. 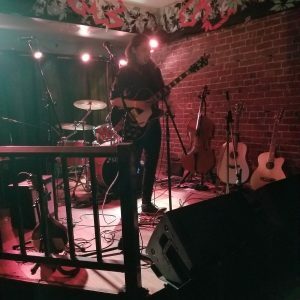 If you see Vic Horvath in your local live music listings, just go check it out. It’s folky-bluesy-rocky (you know what I mean) with a few other sensibilities thrown in there for good measure. In the meantime, be sure to check out Vic’s music from the comfort of wherever you like to listen to music.